The Chicago Cub’s season started strong yesterday with a 3-1 victory Vs. the often played NL Central Pittsburgh Pirates. Jeff Samardzija tossed a gem going 8 innings, giving up 2 hits and 1 walk, while fanning 9. The Merrillville, IN native was then pulled for a 9th inning save opportunity offered to Carlos Marmol, who promptly “Marmolled” his way out of the inning. Carlos struck out his first batter faced followed up with hitting the always dangerous Andrew McCutchen, who then stole second and scored on a Pedro Alvarez single. Marmol then walked Gaby Sanchez which led to Manager Dale Sveum calling in James Russell, and finally Kyuji Fujikawa who earned the save. 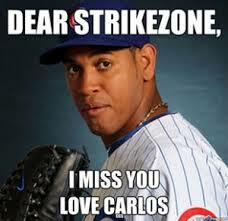 Marmol has been terrible traditionally forcing me to scoff when he signed a three-year $20 million contract in 2011. No, he was NOT better back then, nor “good” or even “serviceable” since. He’s ruined 14 save opportunities for himself in that time span. I know that doesn’t sound like a lot, but 14 games can be the difference between being in the playoffs or watching the playoffs come September. I’ve been praying for Carlos to be traded for years, only after I prayed for him to to not be resigned. I can only hope that he begins to preforms well enough to have another relief-pitcher-needy team look his way. But to do that he has to be in the game, which is ironically, exactly where The Cubs don’t need him to be.